Sitting in Brian Bielmann’s office, we were studying the weather warnings for Hawaii’s north shore. The swell coming toward us was for waves so big they would rip houses off their foundations and drag them out to sea. Brian’s brother, whose house was on the shoreline, had evacuated and boarded up his house. While there wasn’t a full-scale evacuation in effect, it was obvious that many were worried. There was a tension and excitement in the air on the north shore. Everyone was waiting to see what would happen. I asked Brian, who had lived on the north shore for the last 35 years if he had ever heard anything like this and he said no. This was going to be something to remember….To see a gallery of my images from the event check out the Eddie Aikau projects portfolio on my website. There have only been a few times in my career that the stars have aligned as incredibly as with my recent trip to Hawaii. I had scheduled a trip over a month ago to Hawaii to shoot some stock images of surfing. Planning that far ahead means not knowing if any big swells will be coming through during my stay – hence it was a gamble. But this time around, it was a gamble that paid off big time. While on the north shore of Oahu I got the chance to photograph two major surfing competitions, one of which was the Quicksilver Eddie Aikau Big Wave surfing comp. The “Eddie”, as it is affectionately referred to, is the big wave surfing event and has only happened eight times in the last twenty-five years because it requires 20-foot plus size Hawaiian waves, which translates to 40-foot wave faces. The event is held in Waimea Bay, just south of the famous surfing area known as Bonzai Pipeline. 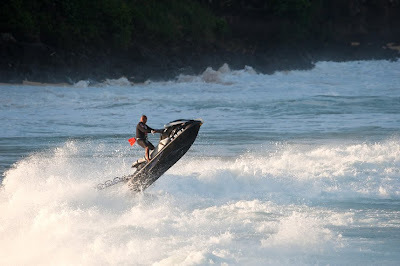 Obviously it is not every day that 40-foot waves roll into Waimea Bay. 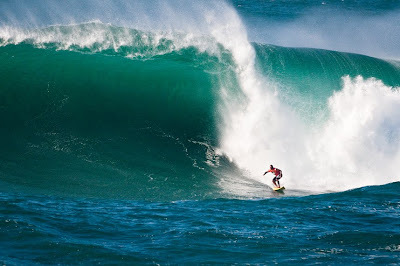 The event is planned each year but if the big waves don’t show up the event doesn’t happen. The last time the Eddie was held was 2004. It is an invitational event with only 28 competitors. This years invitees included such surfing superstars as Andy and Bruce Irons, Kelly Slater, Shane Dorian, Greg Long and many others. The event officially kicked off on my second day in Oahu on December 2, 2009. The event normally has a three-month period in which to run, from December 1st through February 28th. This year the event happened just a few days after the opening ceremonies. Needless to say I was blown away that it happened during my stay in Hawaii. The swell hit on a Monday but the weather was rough and the waves weren’t very consistent. 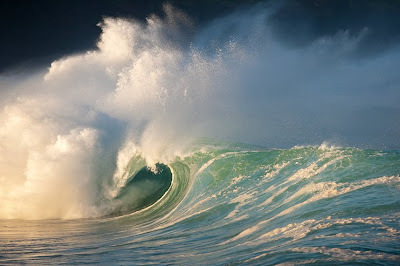 Waimea Bay was taking hit after hit by waves that were in the 20 to 30-foot Hawaiian range, with 30 to 40 foot faces. Thousands of people had clogged the roads and the beach to come watch the Eddie. This is the superbowl of surfing. To the crowds’ dismay, the event was called off for the day because the waves were not as consistent as hoped and the swell was still rising. The next day saw some huge sets rip through the bay early on and the sky was blue and crisp. At 7:30 AM the event organizers announced that the event was on. The first heat had a few big waves, but the second heat really got things going. Kelly Slater caught a huge wave and rode it all the way into the beach, which was a considerable distance away. From our vantage point right in front of the initial big waves we could hear the crowd roaring behind us as he road into the beach break. He scored a 98 out of a hundred for that ride. While that is incredible there were three 100-point rides. Towards the end of the day, in the final heat, there was a large set of 25 to 35 foot waves, with 40 to 50 foot wave faces, that rolled in one after the other, each a bit bigger than the one before. The waves were crashing into the bay and shaking the ground on which we stood. Greg Long, who ended up winning, caught a monster wave and rode it all the way into the beach scoring a perfect 100 points. He wasn’t in contention at all before this set of waves, but his perfect timing and considerable skills put him on top – he won $55,000 for his efforts and bested Kelly Slater and Bruce Irons. Shooting an event like this is difficult. Quicksilver, the main sponsor, had several jet skis in the water, but only a few of them were for media use and those shooters lucky enough to get on the skis were chosen by Quicksilver. The rest of us had to shoot from the shore with big lenses. As it turned out, the best shooting position was in a backyard just off the point. The going rate was $50/hour to shoot from their property and some were paying up to $200/hour. I only stayed there for two hours during the best light of the day. It was front row seating as you can see in some of the images in this blog post. As the day progressed, I moved around finding different angles and perspectives. My gear consisted of a Nikkor AF-S 500mm f/4 lens, a 70-200mmm f/2.8 lens and a Nikon D700 and D300, both with the external battery grip, which allowed me to shoot at 8 fps. By choosing the right camera for the position I essentially had a 1.5 teleconvertor if I needed it with the Nikon D300 since it has a 1.5X crop factor due to it’s smaller than full frame sensor. Talking with Brian later that night after the event, he told me he had never seen Waimea Bay that big. Looking at the photos afterward the waves looked even bigger than we remembered. 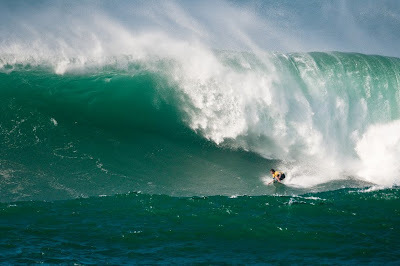 It turned out to be the biggest waves ever for an Eddie Aikau comp and the biggest waves ever for a surfing competition. The waves and the competition made national news three nights in a row. 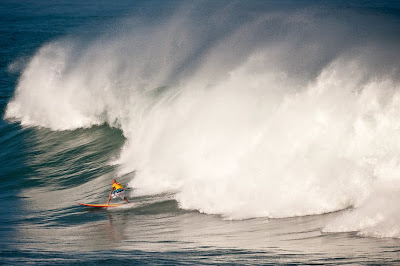 I shot over 6,000 images during my ten-day stay in Hawaii and well over 2,000 on the day of the Eddie Aikau. I have pulled a quick and dirty set of images and put them on my website in the afore mentioned projects portfolio. I have to say thank you here as well to Brian and Shauna Bielmann. I met Brian while working on my book Digital Masters: Adventure Photography – he was recommended to me by Andew Eccles and invited me out to shoot surfing in Hawaii after we did several phone interviews for the book. Without his and his families incredible hospitality I would never have had this experience. You can check out Brian’s work on his website at www.brianbielmann.com. If you'd like to read more about The 2009 Quiksilver in Memory of Eddie Aikau surfing competition and see the final results log on to the Quicksilver Eddie Aikau website.